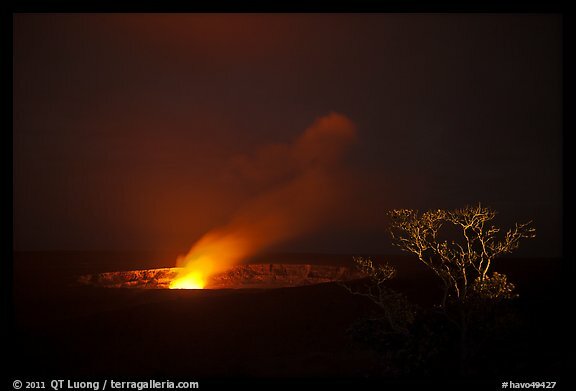 Halemaumau crater – home to Pele, Goddess of Hawaiian Volcanoes according to the traditions of Hawaiian mythology – is a pit crater located within the larger summit caldera of Kīlauea in Hawaii Volcanoes National Park. 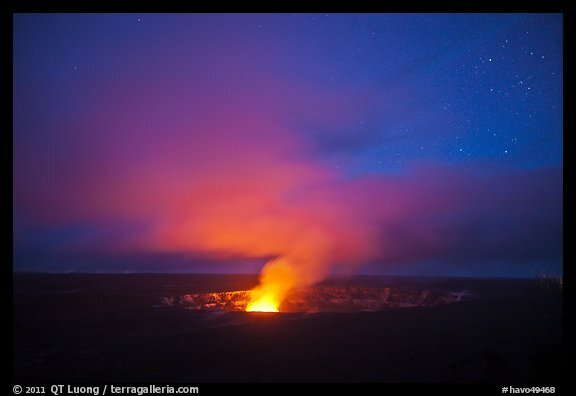 During my previous two visits to the Park, a decade ago, Halemaumau crater was inactive. I remember standing at the Halemaumau overlook and staring at the former lava lake at its bottom, thinking how cool it would have been to see it while it was an active lava lake. The only constant of the Kilauea eruption is the change. Three years ago, in 2008, a series of explosive eruptions awakened the Halemaumau crater. 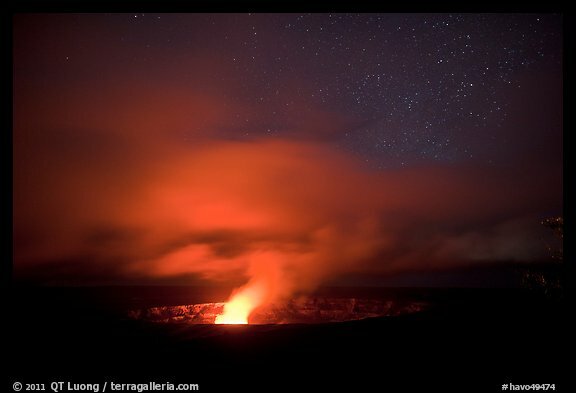 Because of the dangers presented by sulfur dioxide gas emissions, the National Park Service has closed the whole area, including the Halemaumau overlook, and Crater Rim Drive between the Hawaiian Volcano Observatory and Chain of Craters Road. This means that you cannot see the lava lake. You get just a distant view of the venting gas plume. This winter, my parents-in-law visited the Park. They reported that there wasn’t much to see. Indeed, by day, the plume just looks like some smoke. However, I was hoping that at night, molten lava residing at shallow depth within the vent would create a spectacular incandescent illumination that I envisioned against the starry night sky. During my last visit to the Hawaiian Islands this May, no surface lava was flowing at all on the whole Big Island. However, I thought that a chance to actually create the image of the plume that I had in my mind would be worth the flight from Kauai. I couldn’t envision that image a decade ago, since, besides the lack of activity at Halemaumau, film cameras did not have enough sensitivity. When I first arrived at the Volcano Observatory at 7pm, driving straight from Hilo, I was still dressed in shorts and T-shirt. Upon getting out the car, I felt frozen by the combination of temperature, wind, and humidity. At a modest 4000 feet in Hawaii ! However, I was so excited about the glow being present. In a subsequent conversation with the great Hawaiian volcano photographer Bryan Lowry, I learned it had been there only for a couple of weeks. Despite bad weather following me for my last five trips, I sometimes get lucky ! I returned on three different nights to photograph the images below, with a 24mm/f1.4 L II lens on the Canon 5D mk2. The wide aperture of this lens (that I shoot almost always at f1.4 or f2.0) makes it possible to maintain a shutter speed below 30s (to prevent star trailing) and an ISO of 1600 or lower (to prevent excessive image noise). After making the first 4 images, I was still missing the Milky Way. To capture the fifth image, I set up an intervalometer at about 10.30pm on the last night to take images automatically through the night. Although it was cold and raining, the experience of the previous days had told me that the local weather could change at any time. I punched a hole in a plastic bag for the lens, wrapped it around the camera, and secured it with tape before going to sleep. 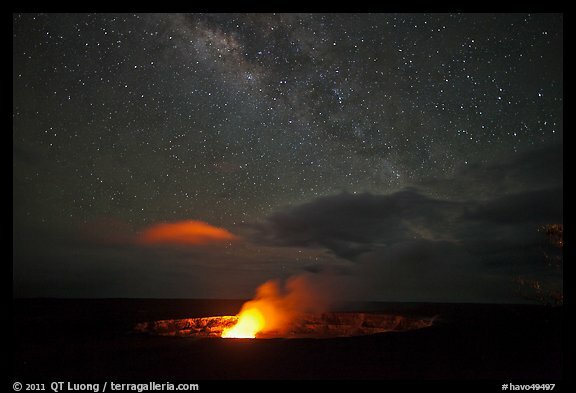 In the morning, I was delighted to find out that the sky did clear out for about half an hour, around 2am, revealing for a brief moment a beautiful Milky Way above the volcano. Pre-visualization paid again! Which image do you prefer? Update March 2018: As we mark the 10th anniversary of Kīlauea’s summit eruption, that image has now because quite common, so to understand my excitement, keep in mind that back in 2011, it was one of the first times it had been captured. Also, since then, the lava level has risen quite a bit, and lava fountains are occasionally visible, but back then that wasn’t the case. the last one with the Milky Way is amazing! Beautiful QT – I love the Milky Way in #5, but the color and stars in #3 is equally fantastic. 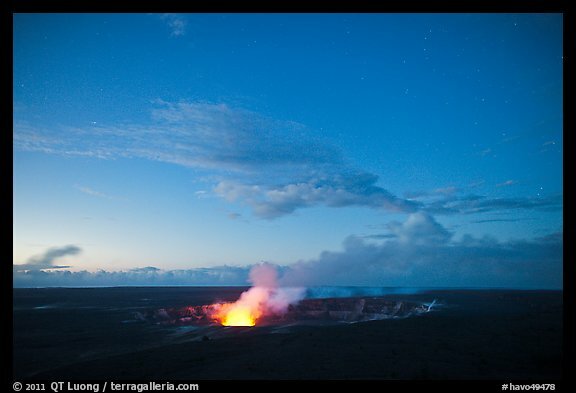 I’ve shot the lava down near Kalapana a lot, but Halemaumau has always been just a steaming pit. Change is the only constant on the Islands! An impossible choice, but if I had to pick, I love the colours and the touch of stars in #2. Hi QT – all great shots; but my fav would have to be #5 as a winner and only just followed by #4. Very nice, indeed! Really tough to choose but I went for #5. I like the colours and with the stars in #2 a lot though as well. The contrast and the milky way galaxy in #5 take my vote, but they are all pretty cool. Thanks for the mention QT. Glad the weather cleared for you. I chose #5. Just saw your Milkyway+vent pic. It’s spectacular. violent gases and creation in one picture from two time eras. here and now and the past of the stars.